Ten Speed Press, 9781607743606, 144pp. The first gluten-free baker to win the Food Network's Cupcake Wars shares her indulgent recipes for cakes, muffins, scones, cookies, brownies, cobblers, buckles, tarts, and more. 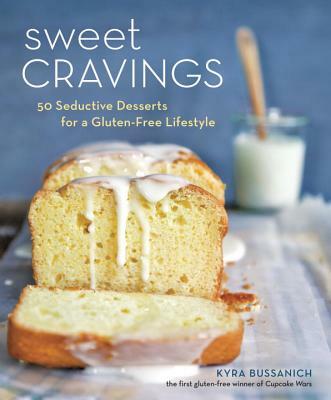 When Kyra Bussanich realized she had to go gluten-free, she mourned the toasty morning muffins, moist birthday cakes, and fruity crumbles she thought she'd have to give up. Attending pastry school during the day, Kyra used trial and error to recreate her favorite treats--sans gluten--at night. Word-of-mouth spread about her scrumptious confections, and soon Kyra opened her very own Portland bakery, Crave Bake Shop. When she competed against "regular" bakers on the Food Network's Cupcake Wars--and won!--she proved that gluten-free can taste just as good as the original. With delicious flavor combinations and unique recipes like Cherry White Chocolate Scones, Boston Cream Pie Cupcakes, and Mexican Chocolate Baked Alaska, this collection of 50 foolproof recipes invites home cooks to whip up sweet treats that everyone at the birthday party, brunch, or potluck can enjoy. KYRA BUSSANICH graduated from Le Cordon Bleu’s patisserie and baking program and worked as the assistant pastry chef at clarklewis in Portland before founding her own award-winning gluten-free bakery, Kyra’s Bake Shop (formerly Crave Bake Shop). She was the first gluten-free baker to appear on—and the only to win—the Food Network’s Cupcake Wars. She was also runner-up in the all-star series Cupcake Champions. Kyra and her shop have been featured on the Today show, Fox News, the Food Network, Food & Wine, Delight Gluten-Free Magazine, Gluten-Free Living, the Oregonian, USA Today, Huffington Post, G-Free Foodie, Notes from a Gluten-Free Kitchen, Gluten Free Portland Oregon, and Portland Food and Drink. She and her husband live and eat in Portland, Oregon.